Jacob Weaver is a Hillsdale College senior and a Churchill Fellow, part of the team completing the final Document Volumes of Winston S. Churchill, the official biography. He was ideally positioned to research press, public and official reaction to Churchill’s key speech at Fulton in March 1946, commonly held to have rung down the Cold War. This paper received an “A” from History Professor Dr. Tom Conner, who recommends it to the attention of Churchill Project readers. This article is replete with references from The Churchill Documents, vol. 22, covering 1946-51, to be published around the end of 2018. Among many revelations, the volume will reveal how closely Churchill liaised over his Fulton remarks with Clement Attlee, the opponent who had ousted him in July 1945. This little-known aspect of the speech illustrates not only Churchill’s collegiality, but his efforts to foster unity on foreign affairs between Britain’s two great rival parties. For a guide to reading on Churchill after World War II, click here. When Churchill spoke on 5 March 1946, Soviet aggression was on the increase. In Moscow a month earlier, Joseph Stalin had predicted an inevitable clash between the communist and capitalist powers.5 Unresolved questions and failed commitments festered at the boundaries of American, British, and Russian spheres of influence. In the Middle East, defying Anglo-American protests, Russia refused to withdraw its troops from Iran within the agreed period and demanded territory in the north.6 The Soviets also attempted to replace the Turkish government with one friendlier to the USSR, hoping to control access to the Dardanelles.7 This act fostered concerns in London, mindful particularly of British interests in Greece.8 Russia also tested the patience of the United States in the Far East, refusing to leave Manchuria despite U.S. opposition. The Soviets did not desire war, he continued. What they wanted was “the fruits of war and the indefinite expansion of their power and doctrines.”16 Moreover, the communist threat “constitute[d] a growing challenge and peril to Christian civilization.”17 The only way to end it was through forceful, unified opposition by the West. Many British leaders were also hostile to Churchill’s comments on Russia. Prime Minister Attlee maintained that neither he nor any ambassador had approved the speech. Yet he refused to repudiate it on the grounds that Churchill had spoken only as a private citizen. Many Labour Members of Parliament wanted stronger action.33 On March 11, Tom Driberg (Lab.-Maldon) and William Warbey (Lab.-Luton) tabled a motion of censure which bore the signatures of 105 Labour Members.34 Churchill’s speech, it declared, was “calculated to do injury to good relations between Great Britain, USA, and the USSR, and [was] inimical to the cause of world peace.”35 Attlee prevented the motion from passing, but the hostility within the government remained. 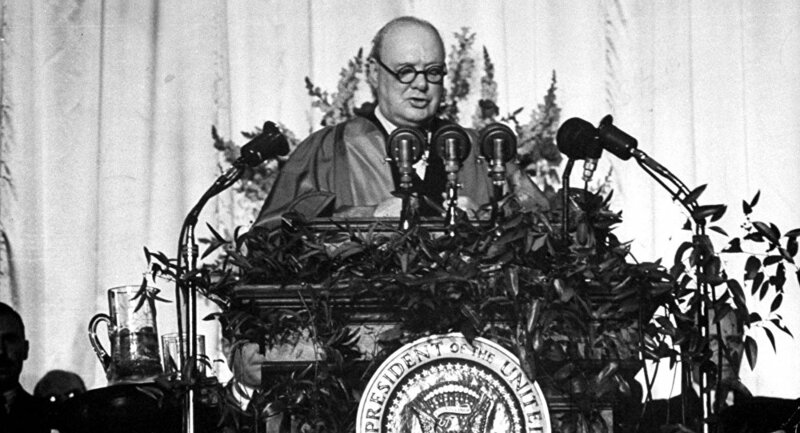 Historians still argue over the effect of Churchill’s Fulton speech. Could the Cold War have been avoided without his intervention? 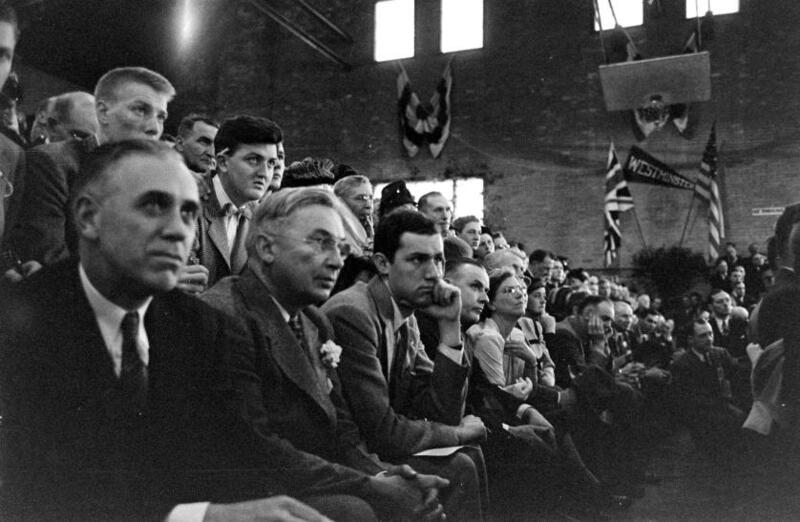 John Blum argued that “at least until the time of Fulton, the possibility existed of a practical accommodation between the United States and the Soviet Union.”45 But Paul Rahe contends that Churchill infused resolve into an American administration already leaning toward resistance.46 Despite these differences, almost all historians acknowledge that it shaped the rhetoric of the postwar powers, instituting important changes in British and American foreign policy. Historical scholarship has slowly shifted in its perception of U.S. attitudes in the months preceding Fulton. 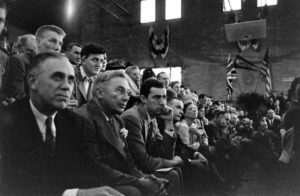 Though many in Washington were conflicted over what policies the administration should follow, it is now known that George Kennan’s “Long Telegram” of February 1946 stood apart as a dominant factor. Despite his intimate involvement with Truman and the American government, Churchill maintained contact with the Labour government that had defeated him nine months before. One of the more interesting aspects of The Churchill Documents Volume 22 is how often, after the 1945 election, Churchill coordinated his foreign policy initiatives with Prime Minister Attlee. Churchill also received British government assistance courtesy of the Americans. The White House asked the British Information Service to help distribute the Fulton speech.62 Though they did not normally publish speeches of non-government officials, they complied, sending advance copies to the press and to British embassies abroad. 1 Felix Gilbert & David Clay Large, The End of the European Era: 1890 to Present, 6th Edition (New York: W.W. Norton, 2009) 53, 279. 5 Martin Gilbert, Winston S. Churchill, vol. 8, Never Despair, 1945-1965 (Hillsdale, Mich.: Hillsdale College Press, 2013), 194. 6 R. Crosby Kemper III, “Introduction: The Rhetoric of Civilization,” in R.C. Kemper III, ed., Winston Churchill: Resolution, Defiance, Magnanimity, Goodwill (Columbia, Mo. : University of Missouri Press, 1996), 22. 7 Gilbert, Never Despair, 195. 9 Lynn Boyd Hinds & Theodore Otto Windt Jr., “Churchill’s ‘Iron Curtain’ Divides the Cold War World,” in Derek C. Maus, ed., The Cold War (Farmington Hills, Michigan: Greenhaven Press, 2003), 59. Churchill did remain in touch with Labour Prime Minister Clement Attlee, hoping to instill a common resolve between their parties over foreign policy. See Martin Gilbert and Larry P. Arnn, eds., The Churchill Documents, vol. 22, 1946-1951 (Hillsdale, Mich.: Hillsdale College Press, forthcoming). 10 John Ramsden, “Mr. Churchill Goes to Fulton,” in James W. Muller, ed., Churchill’s “Iron Curtain Speech” Fifty Years Later (Columbia, Mo. : University of Missouri Press, 1999), 20. 11 “Eager American Audience: Interest in Two Allies,” The Times (London), 6 March 1946. 12 Winston S. Churchill, “The Sinews of Peace,” speech in Fulton, 5 March 1946, in Speech Vault. http://speeches-usa.com/Transcripts/winston_churchill-ironcurtain.html. 19 “Eager American Audience,” The Times (London), 6 March 1946. 20 “Churchill Speech Hailed in London: Call for Anglo-US Tie is Applauded, But Remarks on Russia Bring Division,” The New York Times, 6 March 1946. 22 Chamberlin, William Henry, “Churchill’s Appeal: Dramatized World Political Trends to the Understanding of All; Some Action by the US Seems Likely,” Wall Street Journal (New York), 8 March, 1946. 23 “Churchill Speech Hailed,” New York Times, 6 March 1946. 24 “Union Instead of Alliance,” Washington Post, 13 March 1946, in The Churchill Documents, vol. 22. 25 Gilbert, Never Despair, 205; “Britain’s Call,” Chicago Sun, Churchill later declared that the Sun’s remarks were “stock communist output.” See Churchill Documents, vol. 22. 26 Gilbert, Never Despair, 206; Phillip White, Our Supreme Task: How Winston Churchill’s Iron Curtain Speech Defined the Cold War Alliance (New York: Public Affairs, 2012), 205. 27 Gilbert, Never Despair, 206. 28 “Churchill Speech Hailed,” New York Times, 6 March 1946. 30 “Mr. Churchill’s Speech,” The Times (London), 6 March 1946, in The Churchill Documents, vol. 22. 32 “Churchill Speech Hailed,” New York Times, 6 March 1946. 33 Henry B. Ryan, “A New Look at Churchill’s ‘Iron Curtain’ Speech,” in The Historical Journal, vol. 22, no. 4, Cambridge University Press, December 1979, 911. 34 “Leader of Opposition Office: note,” 11 March 1946 in The Churchill Documents, vol. 22. 36 “Mr. Churchill’s Speech,” The Times (London), 6 March 1946. 37 “Churchill Speech Hailed,” New York Times, 6 March 1946. 40 “Mr. Churchill and USSR: Moscow Attack on Fulton Speech,” The Times (London), 12 March 1946. 41 “Moscow Scorns Foreign ‘Threats,’” New York Times, 13 March 1946. 42 “Moscow Charges Anti-Soviet Drive: Says Case is being Distorted—Alleges China Asked Russia to Stay in Manchuria,” New York Times, 11 March 1946. 43 “Joseph Stalin: interview,” 14 March 1946, in The Churchill Documents, vol. 22. 44 Churchill stated that Stalin’s charges were “flattering,” since Hitler had attacked him in the very same manner. See Gilbert, Never Despair, 213. 45 Hinds & Windt, “Churchill’s ‘Iron Curtain,’” 57. 46 Paul A. Rahe, “The Beginning of the Cold War,” in Churchill’s “Iron Curtain Speech” Fifty Years Later, 49. 51 Gilbert, Never Despair, 219. 52 Truman shared these plans with Churchill on the train to Fulton. See Gilbert, Never Despair, 208. 53 Rahe, “The Beginning,” 64. 55 Hinds & Windt, “Churchill’s ‘Iron Curtain,’” 59. 56 White, Our Supreme Task, 152. 57 Kemper “Rhetoric,” 27; White, Our Supreme Task, 156. 58 Gilbert, Never Despair, 197; White, Our Supreme Task, 156; WSC to President Truman, 29 November 1945, in the Churchill Documents, vol. 22. 59 Ramsden, “Mr. Churchill Goes to Fulton,” 30. 60 Ibid., 26; WSC to Attlee and Bevin, 17 February 1945, in The Churchill Documents, vol. 22. 61 White, Our Supreme Task, 142. 62 Ryan, “A New Look,” in The Historical Journal, December 1979, 908-10. 63 Hinds & Windt, “Churchill’s ‘Iron Curtain,’” 57, 60; Gilbert, Never Despair, 217. 64 Hinds & Windt, “Churchill’s ‘Iron Curtain,’” 63. 65 Ramsden, “Mr. Churchill Goes to Fulton,” 44. 68 White, Our Supreme Task, 205. 69 White, Our Supreme Task, 205; Kemper. “Rhetoric,” 27; WSC to Attlee, 7 April 1946, in The Churchill Documents, vol. 22. 71 Gilbert, Never Despair, 219. 72 WSC to Clement Attlee and Ernest Bevin, 7 March 1946, in The Churchill Documents, vol. 22; Hinds & Windt, “Churchill’s ‘Iron Curtain,’” 61. 73 William Henry Chamberlin, “Berlin Blockade: Russia Hopes to Shut the ‘Open Window’ in the Iron Curtain, But Will Avoid Armed Clash with US,” New York Times, 6 April 1948. 74 White, Our Supreme Task, 219-20. 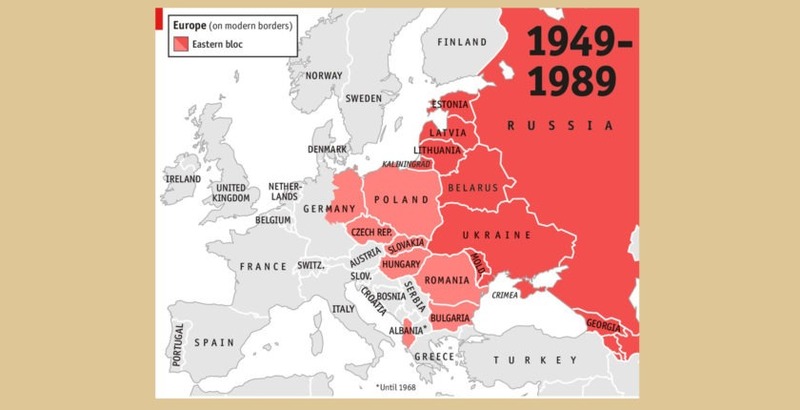 75 Jonathan Mann, “How the Iron Curtain Collapsed,” on CNN, 3 January 2014.